“Choose a single question and get it in front of some users” – that’s what I wrote myself in my aims for the survey book I’m currently writing. can provide their chosen answer. Yes, I could understand it. Yes, I had an answer for them: “not bad, but I’m grumpy because a feature that I paid you for turns out not to exist and it took a series of emails to discover that”. Yes, I wanted to tell them that. But no: the email failed at the final step, a place for me to provide my answer. It offered me two choices: “Bad, I’m unsatisfied” and “Good, I’m satisfied”. Neither works. The support agent wasn’t good: it took several emails for him to understand that I didn’t understand the lack of the feature. But he wasn’t bad either: we did get there in the end. 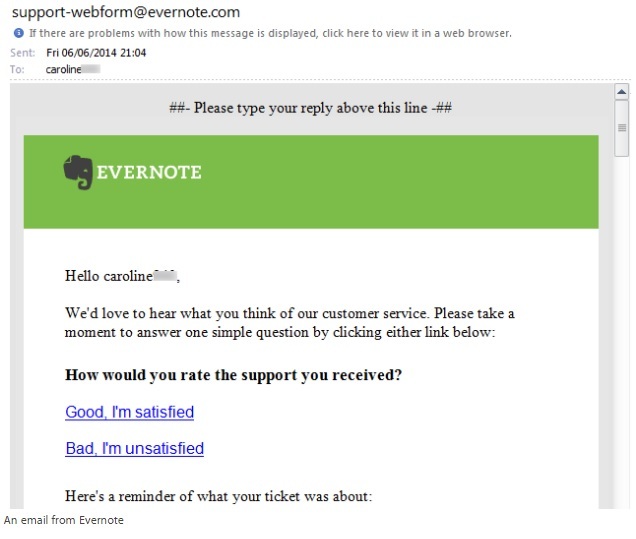 And I’m both unsatisfied with the lack of the feature, and satisfied with other aspects of Evernote. (Although I’m not exactly thrilled that they have addressed me by my name in lower case with a 3-digit number of their choice added to the end. That seems disrespectful). So sorry, Evernote, no click from me. But thanks for the opportunity to think through one aspect of my book.